Region: The Laurel Highlands of PA. This romantic bed and breakfast inn, which has been featured in the WASHINGTON POST and many other newspapers and magazines, enjoys a location beside a covered bridge and trout stream next door to a 4,000 acre park. On-site activities include fly fishing, birding, cross-country skiing / hiking, (15 mi,) and biking. Nearby are Old Bedford Village, the Bedford Historic District, many antique shops, 5 excellent golf courses, Blue Knob Resort (downhill) and Shawnee Lake, (swimming, boating, fishing). 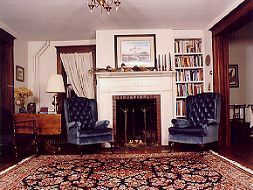 The Inn has 6 guest rooms, all with private bath, a common room, dining room and "the smoke house," a cozy retreat where guests can enjoy wine and cheese or roast marshmallows by a blazing hearth. A cottage which sleeps 6 and has a fully equipped kitchen is available for families or several couples. 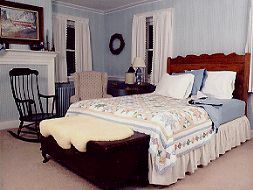 Both the Inn and cottage are smoke-free indoors, (both have porches for smokers). A full breakfast is served to Inn guests in the dining room or on the wrap-around porch, (weather permitting). Your Hosts: Greg & Martha Lau. Rates: $80-100 Double. 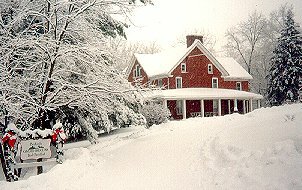 Two night minimum stays on holiday, fall foliage weekends and ski weekends. AAA rated. - Gift Certificates Available - Seasonal packages suitable for birthdays, anniversarys or any special occasion are available. 9 Miles from exit 11 I-76. 2.5 Hrs from DC and Baltimore. 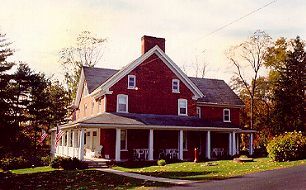 This and other Laurel Highlands Bed and Breakfast Inns can be found here in The Register.